This tutorial is designed for beginners who want to get started with PROC SQL Joins. 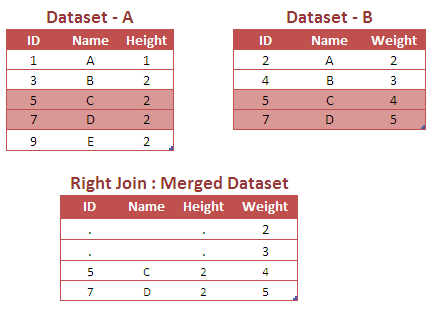 It explains different types of joins and the equivalent data step merge code for these joins. PROC SQL joins do not require that common variable have the same name in the data sets you are joining, while you need to have common variable name listed in BY option when using MERGE statement. PROC SQL joins can use comparison operators other than the equal sign (=). PROC SQL can handle many to many relationship well whereas Data Step Merge do not. The Cartesian product returns a number of rows equal to the product of all rows (observations) in all the tables (data sets) being joined. For example, if the first table has 10 rows and the second table has 10 rows, there will be 100 rows (10 * 10) in the merged table (data set). 1. Since the first data set has 5 rows and the second data set has 4 rows, there are 20 rows (5 * 4) in the merged data set. 2. The 'as' keyword (aka alias) is used to assign a table a temporary name. 3. 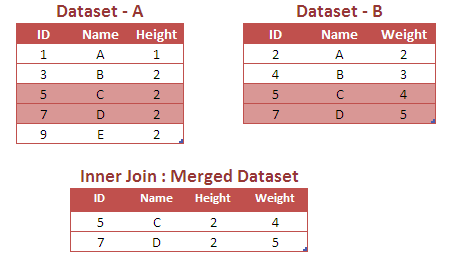 Since the ID values of the first data set is different than the ID values of the second data set, the ID given in the joined data set is misleading. It returns rows common to both tables (data sets). If we select * keyword in the query, the final merged file would have number of columns equal to (Common columns in both the data sets + uncommon columns from data set A + uncommon columns from data set B). Both the codes produce same result. It returns all rows from the left table with the matching rows from the right table. Since the above case is of type LEFT JOIN, it returns all rows from the table (dataset) A with the matching rows from the dataset B. It returns all rows from the right table that do not match any row with the left-hand table, and the matched rows from the left-hand table. Note : The right-hand table ID values are missing in the merged table. 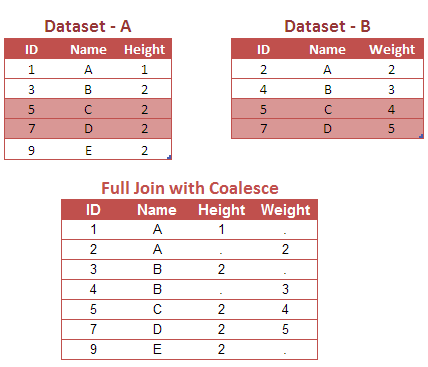 To add the missing right hand table ID values to a right join, you can use the SQL COALESCE function. The COALESCE function returns the first non-missing argument. Since the above case is of type RIGHT JOIN, it returns all rows from the table (dataset) B with the matching rows from the dataset A. It returns all rows from the left table and from the right table. Key takeaway : The FULL JOIN suffers the same difficulty as the RIGHT JOIN. Namely, the common variable values are lost from the right-hand data set. The COALESCE function can solve this difficulty. Since the above case is of type FULL JOIN, it returns all rows from the table (dataset) A and B. By default, MERGE statement performs full join so IN variables are not required. SQL Join will return Cartesian Product if duplicate values are found in primary key (common column). In this example, it returns cartesian product of missing values in the "ID" column. Since dataset A has 3 missing values and dataset B has 1 missing value, there are 3 (3*1) missing values in the merged dataset. 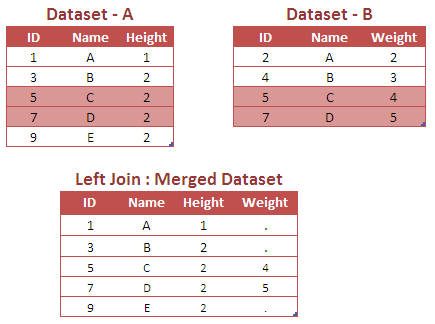 Data Step MERGE statement will return the maximum number of missing values in the primary key in both the tables. In this case, it would return 3 missing values i.e. max(3,1). How about six rows of value 5 in the combined table? When duplicates, PROC SQL returns cartesian product i.e. product of both the tables. In dataset A, we have 2 5s and 3 5s in dataset B. So, it returns (2x3 = 6) 5s in the combined table. 41 Responses to "Lesson 2 : PROC SQL : Joins"
Its Very Useful... Thanks a lot sharing..! Thanks Deepanshu for sharing this valuable knowledge. Its really a treasure for beginners like me. Well explained..Its really useful especially for beginners. Thank u for sharing. really very helpful ! i have one doubt explain the ten procedures which were used in SQL? Extremely helpful, thank you very much ! Really very helpful but I found a small typo. In the full join SQL code wont it be 'full join' instead of 'right join'? Thanks for pointing it out, typo now corrected! Glad you found it useful. Cheers! Excellent! good explanation with codes . . . very useful! (Common columns in both the data sets + uncommon columns from data set A + uncommon columns from data set B). If you include "*" keyword, it would select variables from both the tables. Thanks for pointing it out. I have corrected the code. Cheers! By default, MERGE Statement performs FULL JOIN so "if x=1 or y=1;" is not required. Please let me know incase any query(s) Thanks! The output record will be prepared either from the record of A or B, hence the statement "if x=1 or y=1;" will not be required to mention and it will be by default. Well explained about joins. Very use full for the beginners. Did you read the first paragraph 'Advantages of PROC SQL Joins over Data Step Merging'? That's answer of your first question. Second question is also discussed in the article. 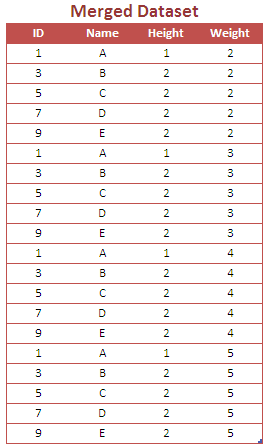 If you have duplicates in any of the tables, you would get cartesian product of the duplicate records. Was very useful.!! Well explained. What about Outer joins? How it will be prepared using PROC SQL? This is really great website. I'm glad I found it. How many datasets can be merged in proc sql (sas 9.4)? Great, thanks for posting this. I appreciate your work and thanks for creating a decent tool. If you'll mention the rules that would be great. Also add interesting scenarios bit logical concepts. and Syntax of every function statement. I dont think ur explaination about inner join is accurate, ud better compare that with Proc SQL outter join.